Looking for the very best Costa Rica has to offer? Spoil yourself as you experience the jungle, sun and sand on these custom-designed luxury vacation packages. You won’t want to leave! Ready for some digital detox in the Costa Rica wilderness, while still indulging in luxurious perks? This 7-night Off-The-Grid Costa Rica Getaway is just what you're looking for. Spend two weeks in comfort and indulgence with this extended luxury holiday. Explore the rainforest, Manuel Antonio Beach, and the Osa Peninsula! Experience the best of the best that Costa Rica has to offer with 5 star hotels and the greatest tours. This is a luxury escape that everyone will enjoy! Travel across the country with your teens in a private helicopter and stay in two unique luxury lodges of Costa Rica. Rainforests, beaches, and adventures. Stunning locations and an elegant ambiance paired with all-encompassing service add up to a perfect luxury vacation! Relax and enjoy the best of Costa Rica with this luxury package for couples. If your looking for attention to detail, comfort and effortless opulence. Experience unaltered nature of Nicaragua and Costa Rica while getting spoiled. Our luxury eco lodges offer incredible services and amenities! Beside ‘zero edge’ pools, this custom vacation also features zero downtimes. How? Your transportation to three secluded areas of the tiny Costa Rica paradise is exclusively by air. Visit one of Costa Rica's finest resorts. Explore beaches, hillsides, forests, on-site activities, and gourmet dining while you get the luxury treatment you deserve! 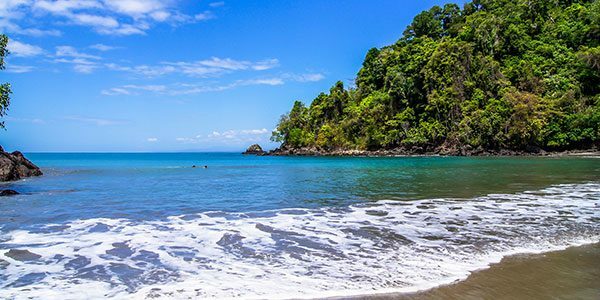 Luxury Costa Rica vacations are a time to relax and disconnect from the stress of the day-to-day routine. There is no better way to do that than escaping to paradise, and the right way to do it is with a personalized stay. These Costa Rica luxury vacation packages are designed to go above and beyond a traditional getaway. They include the best luxury resorts, world-class It’s also possible to customize them even more to suit your personality. Costa Rica is well-known for its adventure tours and sustainable ecotourism, and it’s also becoming the forefront of luxury travel. There are many extravagant and boutique options for the hedonist traveler. This small country has award-winning resorts with world-recognized spas and personalized service. Get the luxury experience you deserve while exploring a tropical paradise with so much to offer. If you don’t know where to start, this is the place for the right advice. Located in the country’s top destinations, from the center of the city to off-the-beaten-path and everywhere in between, we’ve chosen only the top hotels that offer the best in luxury amenities. Enjoy the diversity of these locations and the various styles of the accommodations. Stay in private bungalows, chalets, tree houses and hotel rooms that are designed for comfort and tranquility. Choose from family-friendly or adult-only accommodations. Allow these destinations to surpass your expectations with their high-quality furnishings, elegant style, and exclusive ambiance. Take in the breathtaking views of tropical gardens, active volcanoes, expansive oceans, and peaceful mountainsides. Attentive staff will cater to every need. Going on a luxury Costa Rica vacation is not just about staying in a world-class hotel. It’s also about enjoying the many options the country has to offer to enjoy adventure, flora, fauna, and the Costa Rican culture. Available activities depend on location and, most of all, your desires. Let the stress melt away while relaxing in natural hot springs or treat yourself to a spa treatment. Step away into a private oasis and listen to the sounds of the jungle—and nothing else—from your own plunge pool. Find the secret hideaways and quiet corners of each destination and let the peace overcome you. Enjoy some down time outside on a private balcony and soak in the scenery or watch the animals play on the patio. Go on a guided nature walk to get up close with the wildlife of this diverse country. Knowledgeable guides will provide vast amounts of information that will expand your understanding of the flora and fauna that make this destination so special. Visit waterfalls or the beach and after a full day of enjoying nature, lounge by the pool or take a siesta in a hammock. Schedule some playtime with enticing activities like golf or tennis. Indulge in candlelit dinners with your favorite bottle of wine, a gourmet lunch served right on the beach, or breakfast brought into your room. Savor the flavors of the diverse menus offered as internationally renowned chefs play with local and international flavors that are a treat for the taste-buds. As experts in luxury travel, we take great pride in providing our clients with the best treatment. A luxury Costa Rica vacation starts from the moment you get off the plane and are greeted by our representative. Whisk through customs in the VIP line and head directly to the private driver that’s ready to go. This exclusive Meet and Greet service is just the start. VIP treatment and personalized service follow you everywhere, traveling in style from start to finish. All transportation is in pre-arranged, private and air-conditioned vans with English-speaking drivers. Experience the best treatment while watching the stunning Costa Rican scenery pass by the window. The driver will be happy to answer any questions about the country, and if you want to stop along the way for photos, just ask! For your convenience, all of our packages include access to 24/7 concierge service while in-country. Contact the locally based team for anything you need, including booking tours, setting up dinner reservations, or simply asking for recommendations. Contact us and start planning your dream vacation today. Enjoy peace of mind with a seamless experience and the luxury vacation you deserve.! Stay at the boutique hotels! You will be pampered and spoiled like nowhere else. Costa Rica eco-luxury hotels are extraordinary— many offer our clients such luxe amenities as private pools, soothing hot tubs, exquisite dining, and private tours—grants privileged access to Costa Rica’s most coveted locations. Simply follow the advice of your luxury travel experts and you’ll be in the hotel of your dreams!